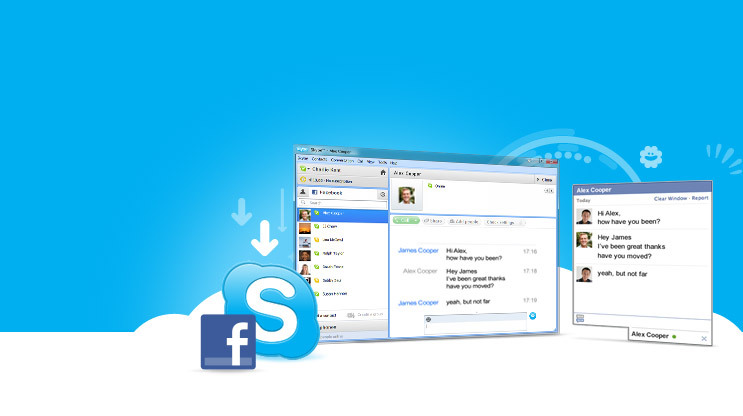 Skyp Download update comes with a deeper Facebook integration. Without having to leave Skype, you can check out when your Facebook friends are online and instant message with them from the new Facebook Contacts Tab (located in between the Skype and Recent Contacts tabs). You can also view and update your Facebook status and even view comments or ‘like’ posts from your Facebook Wall, directly from Skype Home. You may also be unable to make yourself invisible in Facebook when setting your Skype status to Invisible – no workaround is currently available for this problem, while Skype may also prevent your computer from going to sleep while it’s running. The only suggestion here is to quit the application before leaving your computer. In the Skype home tab users can now click the Facebook Friends link to see the latest posts in their news feed. The interface here isn’t going to win design awards, but it doesn’t get in the way or make the feed unreadable. The main thing I don’t like is that it doesn’t auto-refresh. A Refresh icon in the upper left corner will indicate if there are more items. But to get them, you must click. In the news feed area users can comment on or like posts as with any good client. However, with commenting I encountered a similar refresh problem. Until I clicked on the comment button for a post, there was no indication of existing comments (unless they existed before I loaded that feed item). This isn’t so bad if you just want to keep a cursory eye on your feed. If you engage in many conversations, Skype probably isn’t the best interface. Posting to Facebook from Skype is pretty basic and only in text. I tried adding a link to a post and the special link interface didn’t come up in Skype. It will let you post links, they’ll just show up as text. The Facebook tab on the contacts list works just like Skype contacts. It highlights online friends with green icons to indicate active and yellow to indicate idle. Offline contacts are below. Chatting is the same, but instead of giving users the option to initiate a video or voice call, there’s only a “Call Phone” button. And, so far, it doesn’t seem able to pull phone number data from Facebook for this purpose. You have to add a contact’s phone number yourself. The developer has also made a number of updates to make your Skype calls on Windows even better. Skype improved the controls for video and group video calls for Windows, enhanced video call reliability and made several design changes to improve your overall Skype experience. Video performance has been improved via a series of changes designed to reduce the load on your graphics device, which has benefits for those with older cards or chipsets. Skype has also rejigged the emoticons available during text-based chats, adding a number of new ones that include (facepalm), (highfive), (fingerscrossed) and (waiting). Among various design changes are a stripped down call control interface, with less buttons onscreen when making a call – additional controls such as screen sharing or file sending are now hidden behind a + button. In addition to these new features and minor changes, Skype for Windows 5.5 also features a number of numerous bug fixes, although it has been released with a number of issues. If switching network connections at any time, your Facebook connection may be lost – Skype suggests either restarting the application or changing your status to offline and then online again. For those who installed MP3 Skype Recorder following yesterday’s tip, the good news is that while Skype 5.5 removes the Extras Manager, MP3 Skype Recorder will continue to function even after this has been removed. It appears that MP3 Skype Recorder only requires the Extras Manager to be present when first installed.